Find a comfortable easy chair in front of the fire and grab your copy of ONE YULETIDE KNIGHT from the authors at Prairie Rose Publications! Travel back to medieval times to celebrate Yuletide with these dashing knights and their spirited ladies in a wonderfully romantic boxed set of stories you won’t want to put down! Lose yourself in this collection of eight exciting stories of medieval days penned especially for this most joyful time of year. With exciting tales by talented authors such as Deborah Macgillivray, Lindsay Townsend, Keena Kincaid, Cynthia Breeding, Angela Raines, Patti Sherry-Crews, Beverly Wells, and Dawn Thompson, you’ll find it hard to put this collection down until you’ve read to the very end! 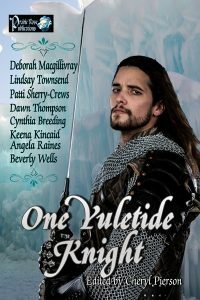 Don’t miss these adventures of holiday romance spiced with medieval danger in ONE YULETIDE KNIGHT!